Can Teens Join a Gym? Ivy Morris specializes in health, fitness, beauty, fashion and music. Her work has appeared in "Sacramento News and Review," "Prosper Magazine" and "Sacramento Parent Magazine," among other publications. Morris also writes for medical offices and legal practices. She holds a Bachelor of Arts in government-journalism from Sacramento State University. With more and more schools cutting physical education classes, joining a gym can be a great way for a teen to stay physically active. Teens need 60 minutes of physical activity a day in addition to a healthy diet to stay fit. Many gyms allow teens to join, as long as the teens have their guardian's permission and the guardians pay and agree to the membership fees. Gyms that allow teens come in two main types: community and private. Community gyms are often nonprofit, run by religious or other community organizations. Nonprofits, such as the YMCA, have low membership fees or one-time use fees. Private gyms run for profit and prices are higher than the nonprofit gyms. Generally, both gyms require you to sign a membership agreement and give a brief health history. While most private gyms serve teens and adults, a few select gyms only allow teens. These gyms give more one-on-one instruction to ensure the teens safely use the equipment. Different gyms have different age restrictions. Some gyms do not allow anyone under 18, while some nationwide chains, such as 24 Hour Fitness, allow minors ages 12 to 17 to join. 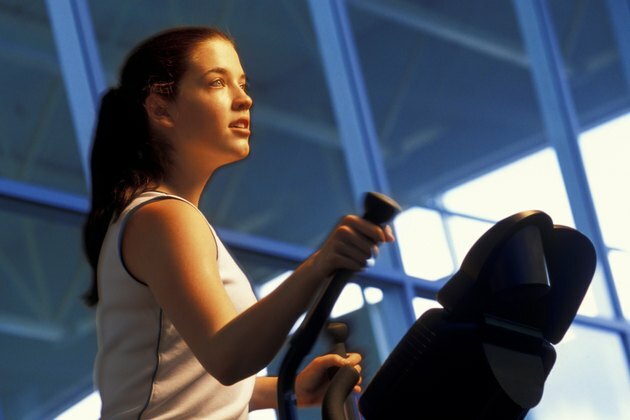 Some gyms only allow teens to workout in the designated youth facility area, while other gyms allow teens the same freedom to use the equipment as the adults. Depending on the gym, you may only sign in when an adult accompanies you, or you may be able to come and go on your own. In addition to gym membership, some gyms offer classes and programs especially for teens so teens can do yoga, hip hop aerobics, or play dodgeball with their peers. Several gyms have summer programs with structured activities, games and instruction on physical fitness. Some gyms offer weight-loss classes for teens ages 13 to 18, that include a nutritional program. Community gyms especially focus on team sports, where teens can compete in basketball, swimming or even gymnastics. Before joining a gym and beginning a new fitness regime, a teen should have a physical exam with his doctor. If a teen has a health condition that could affect his ability to safely workout, the gym may require his doctor's clearance. A teen should have someone demonstrate the equipment before using it and always have an adult nearby to spot or supervise weight lifting. Additionally, the teen should follow good practices for safe exercise -- warming up for 10 to 15 minutes before exercising and cooling down after the workout. How Much Should a Teenager Exercise in a Week? How Many Calories Should Teenagers Eat?